Uncategorized | It's "pwned" idiots not "pawned"
Command line uninstall of LogMeIn, I had a need and this is what fixed me up! Their solution only hinted at the fix – for me dumping or querying the registry didn’t show me anything. 3 – Download PSTools from Micro$oft, unzip it co c:\temp\pstools, open a command prompt then execute the command to that workstation so you can get a remote command shell: psexec \\workstation-name -u yourdomainhere\youruserhere cmd <- Then hit enter. It will ask you for a password. * I think that long string of garbage is somehow tied to your account – it lets you install the msi via command line. After kicking off the install with that msiexec /i command pointed to the logmein.msi file I got the email that the workstation has been added and I could get in! Quick note here on a Dokuwiki error I encountered. Good luck and definitely let me know if this helped you out. So, make an “updater.bat” file and copy the below data into it. echo thus we don’t need the patch! NIC installed – it was a small daughter board on the mainboard inside the unit, you can’t see it unless you unscrew and get into the side cover. It has a long 10 pin power cable and data cable that goes from the daughter board to the NIC which is about as small as a USB thumb drive that’s mounted on the back of the unit. I believe Zebra calls them “external”. Parallel Port – on the main board and hadn’t been used ever. The problem was even though I was using the correct driver, downloaded from zebra.com it didn’t seem the PC was communicating with the unit. There was no USB option. After fiddling with it for HOURS I popped the daughter board out and off of the main board. Up till this point I tried everything to configure the unit from the front console panel (which is a nightmare until you figure out what it’s doing!). It turned out that once I got that external NIC unplugged from the unit and power cycled it the PC would THEN communicate with the printer and worked wonderfully! So, if you have a parallel connection NOT working see if you have a NIC installed on the unit like I did. Get into the unit, unplug the external NIC, unmount it from the main board, power cycle and retry. Definitely let me know if this helped you because I didn’t find a solution online, like the majority of what I post nobody’s posted it or made it easy to find. 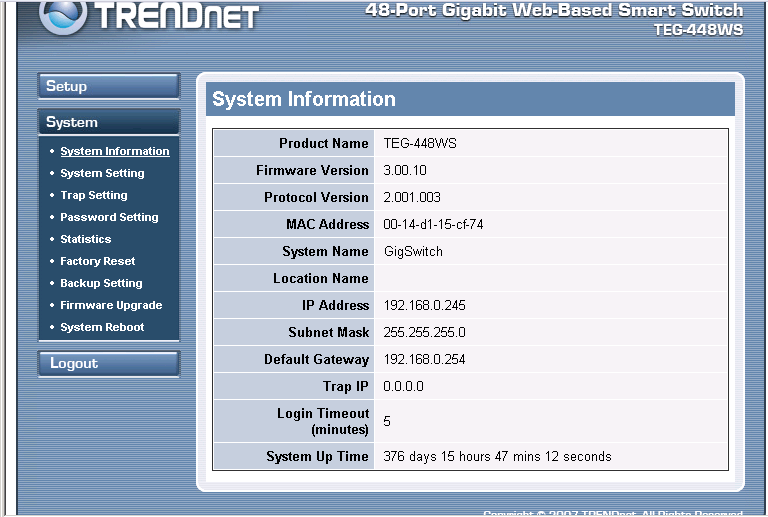 TrendNET TEG-448WS Gigabit Switch Uptime is AMAZING!!! I have a client who I recommended upgrading to a reliable and inexpensive managed switch. We took 3 D-Link gigabit switches and consolidated to one 48 port TrendNET TEG-448WS Gigabit Switch. I must admit, I was a bit nervous putting all our eggs into one basket. We bought the switch from NewEgg and it only had one review. The reviewer said the switch was slow on large data transfers and they didn’t speak highly of it. We took a small calculated risk and boy did it pay off. Switch has been up for 376 days and counting with not one xfer error!